Meeting the equipment needs of today’s fast-paced oil and gas industry demands responsiveness, innovation, and accuracy. As the largest privately owned Oilfield Solutions company in Canada, with international operations stretching around the globe, Sanjel Corporation embraces the use of design technology to promptly deliver better performing, more reliable products to gas and petroleum-producing customers. Sanjel designed and manufactured this specialized redundant cementing skid in a fraction of the time and at lower cost. Sanjel standardized on the SOLIDWORKS 3D CAD software because it is easy to learn and use, helps engineers overcome design challenges and create innovative concepts, and provides access to the integrated SOLIDWORKS eDrawings® communications and SOLIDWORKS Simulation analysis applications. The company’s designers believed SOLIDWORKS software was better suited to help them achieve their goal of responding more quickly to market demands for innovative, high-quality equipment. The move to SOLIDWORKS software has enabled Sanjel to dramatically compress its development cycles. For example, an oil drilling customer in the Middle East needed a specialized redundant cementing skid. Sanjel engineers designed and manufactured the equipment, which uses the company’s new SCM (Sanjel Cyclonic Mixer) cement mixing technology, in a fraction of the time it would have taken without SOLIDWORKS software. Spence attributes the efficiency improvements to the combination of design reuse and virtual prototyping. “SOLIDWORKS software enables us to develop equipment rapidly, which gives us a definite advantage,” Spence says. Sanjel uses SOLIDWORKS Simulation to eliminate design errors, cut development costs, and improve product performance. The company utilizes SOLIDWORKS Simulation to ensure that its equipment is rugged enough to withstand oilfield conditions, and SOLIDWORKS Flow Simulation to make sure that fluids ranging from cement to oil flow smoothly through piping, flanges, elbows, valves, and other fittings. 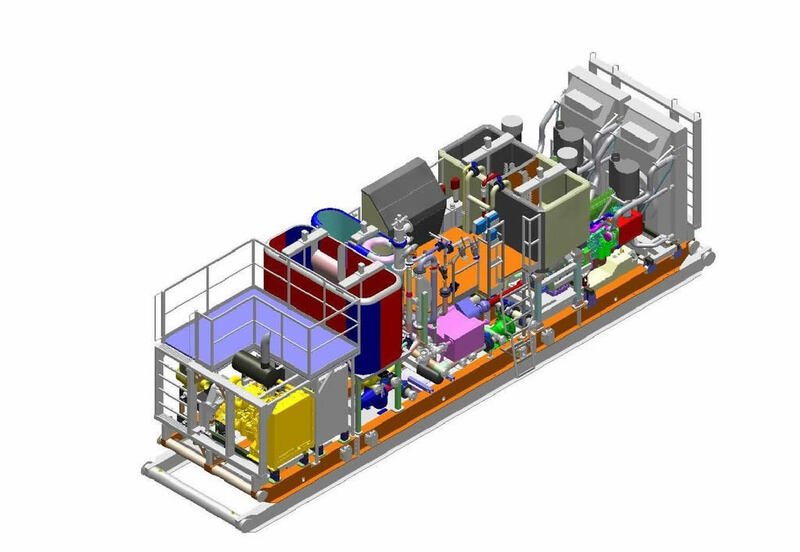 With SOLIDWORKS Simulation, Sato estimates that Sanjel has cut its prototyping costs by 25 percent, and reduced scrap by 50 percent. “What we used to achieve by modifying a physical prototype, we can now do in software. That saves time and money because we use less material,” Sato stresses. SOLIDWORKS eDrawings helps Sanjel engineers communicate design information to customers and field service personnel. “We use eDrawings files extensively to email information to our operations personnel,” Spence says. “eDrawings software is a very powerful tool because it better equips our people in the field. “They can use an eDrawings file to rotate the model, and we can provide them with as much information as necessary. We can also control access to the information depending on the need—such as the ability to do cutaways, apply transparency, or hide components—which makes our field operations more agile and flexible,” Spence notes. Improve responsiveness to the equipment needs of oil and gas exploration and production customers through increased quality, better flexibility, and faster delivery. Adopt the SOLIDWORKS 3D CAD software development platform and leverage integrated structural and fluid-flow simulation technologies.